We all would have heard this Elephant story in our childhood. In which, Elephant-Gajendra prayed to god Vishnu to save him. Vishnu came to the aid of Gajendra, who offered a lotus to the god. 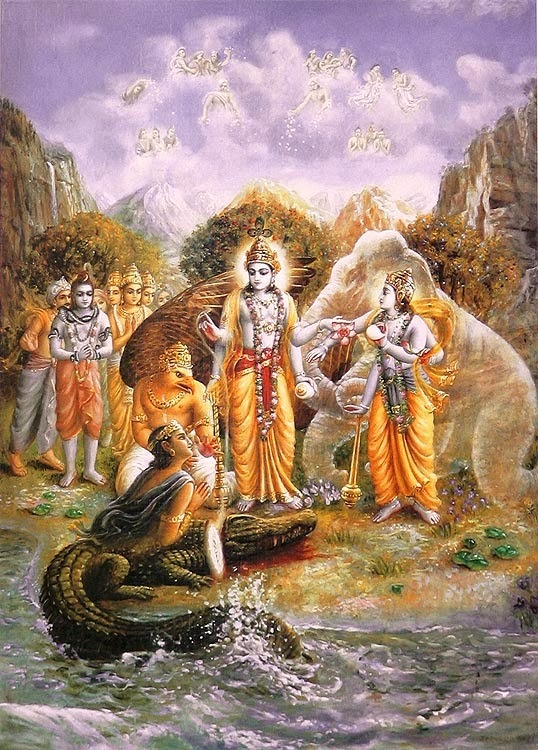 Vishnu attacked the crocodile and saved His Loved One. We are in the place where this incident took place. This is another significance of this place. We are in the journey related to epic Ramayana, according to it we are in Sonpur/Sonepur, situated on the banks of the River Gandaki in Saran district in the Indian state of Bihar. We can also see the confluence of river Ganga and Gandaki, where Gajendra Moksham took place. We can see the significance of Gajendra Moksham spread all over the places of Sonepur. Let us hear the story from the place where the Gajendra Moksham happened. Sonepur is well connected by road to the nearby City of Chapra, Hajipur, and cities. Sonepur is 25 kilometers from Patna, which is well connected by air, rail and road to the other parts of the country. The story of ‘Gajendra Moksha’ comes in the 8th skanda, chapters 2-4 of Bhagavata purana. When Shukacharya (Son of Sri Ved Vyas, Bhagvanta’s literary incarnation) was describing the story of how Lord Hari delivered His devotee Gajendra, Maharaj Parikshit (Arjuna’s grandson & Abhimanyu’s son) asks him to narrate the story in detail. As a phala sruthi of this story the Lord says “To one who recites this story early in the morning, I will give them knowledge and consciousness necessary for them in their last moment of this body which will lead to salvation”. Remembering the Lord at the end of this life is critical for upliftment (anthakala visheshatah). Also, if you read this stotra, you will not get bad dreams and even if you do, the dream will not materialize into reality. Now let us here about Gajendra Moksham, from the banks of river Gandaki. The so-called Gajendra Moksha legend centres on two characters, King Indradyumna and the Gandharva chief Huhu. 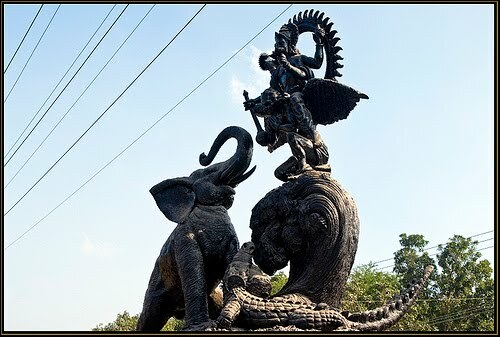 Due to a curse that originated with the ancient sages Agastya and Dewala Muni, Indradyumna and Huhu were said to have been turned into an elephant and a crocodile, respectively. There was once an elephant king named Gajendra who along with his herd was living in a forest. They were on a mountain called Trikuta (3 peaks). When they were roaming in the forest, they felt thirsty and started going on a path in search of water. In a far distant place, they saw a beautiful garden called Rtumata which was created by Varuna. The garden had a beautiful lake. They were all very happy to see the lake and proceeded towards it. They entered the lake, bathed thoroughly and were relieved of their fatigue. Then, with the aid of his trunk, Gajendra drank the cold, clear and nectar like water, until he was fully satisfied. Suddenly, a strong crocodile attacked his leg in the water. The elephant was certainly strong, and he tried his best to escape from the crocodile’s clutches. The elephant and the crocodile fought in this way, pulling one another in and out of the water, for one thousand years. Initially, all his family, relatives and friends gathered around to help him, but in vain. They realized that ‘death’ has come close to Gajendra and they left him alone. Gajendra trumpeted in pain and helplessness until he was hoarse. He realized that no one can save him and with complete surrender turned to God for help. Gajendra remembering prayers from his last life called to Lord Vishnu to save him. The prayers offered by Gajendra are very powerful and famous and are known as ‘Gajendra Moksha stotra’. Hearing His devotee’s call and prayer, Lord Vishnu rushed to the scene riding on a Garuda. As Gajendra sighted the Lord coming, he plucked a lotus flower and offered it to the Lord and prayed to HIM to rescue him. Lord lifted Gajendra’s feet along with crocodile and then cut the crocodile with His Sudharshan Chakra. As HE severed the head of the crocodile, a beautiful gandharva Huhu, a great musician in the heavenly planets, came out of the body of the crocodile. Huhu had begotten a curse from the Devala rishi for having insulted him. Lord Vishnu wasted no time to leave Vaikuntha upon hearing Gajendra. He may be "alankaara priya", one who loves adorning himself, but now was not the time. He forgot his uttariyam (upper cloth) and grabbed whatever he could get hold of. It was when he wrapped Gajendra's wounds with his upper cloth, after killing the crocodile, that he realized that he had worn Lakshmi Devi's sari as his upper cloth! He got his ornaments all wrong and ornaments which were to be present on one part of the body, were actually found on another. Such was his haste! Due to the spiritual progress he made in his past life, Gajendra was able to remember God’s name. In his past life Gajendra was a king by name Indradyumna. He was a devotee of Vishnu. Once when he was meditating, the sage Agasthya came. The sage got angry that he was not received properly and cursed the king because of whom the king was born as an elephant in this life. The curse given by the sage became a benediction for him for he had the fortune of seeing the Lord. Why did Perumal rush to the spot? He is omnipresent and therefore present even in the teeth of the crocodile. Why couldn’t He have made the crocodile’s teeth shatter? When Prahaladan was thrown in the fire Perumal helped Prahaladan without appearing before him. Perumal made the fire cool to touch, He shatterred the fangs of the snakes which tried to bite Prahaladan. Similarly when Draupadi was in distress, He didn’t appear at Hastinapuram but protected her from His distant abode of Dwaraka. Similarly, couldn’t Perumal have protected Gajendran without making an appearance? Perumal would have helped Gajendran from His eternal abode of Sri Vaikuntham but Gajendran didn’t call the Lord for protection. Draupadi had called Him to protect her from being humiliated and the Lord had appeared as her clothes. Prahaladan had informed his father about the omnipresence of the Lord and mentioned that the Lord was also in the pillar pointed by Hiranyakashipu. To prove Prahaladan’s words, the Lord appeared from the pillar pointed by Hiranyakashipu. Now gajendran called to the Lord not for protection but to offer the golden lotus bloom! Gajendran didn’t call Perumal asking Him to rescue him from the crocodile but Gajendran only wanted Perumal to accept the lotus bloom. Gajendran had kept the lotus bloom fresh with love by repeatedly dipping it in water. Gajendran didn’t worry about his feet stuck in the crocodile’s mouth, nor did he pay heed to the excrutiating pain but his mind was preoccupied in keeping the lotus fresh for Perumal. Hence, to reciprocate Gajendran’s love perumal had to come in person to accept the lotus. He rushed to the spot to show Gajendran His immense love for Gajendran. If He manifested suddenly in front of Gajendran it won’t express His love properly. If Perumal freed Gajendran by shattering the teeth of the crocodile again it won’t serve Gajendran’s request as He wouldn’t have accepted the lotus from Gajendran.. This legend is said to have taken place here. As Gajendran had called Perumal as the cause of the Universe, Perumal appeared with Garudazhwar. This is because Garudazhwar is the embodiment of the Vedas and the proof that Perumal is the Supreme Cause of this Universe. As soon as Perumal arrived on Garudazhwar, Gajendran trumpeted in joy. Perumal did not kill the crocodile immediately. He stepped in to the pond and carried both the elephant and the crocodile to the shore. He then targeted the crocodile’s jaw and hit the crocodile’s jaw with His chakram. As soon as the chakram touched its jaw, the crocodile opened its mouth and released Gajendran. The crocodile died and Huhu was released from his curse. Perumal looked at the elephant with love and inspected the elephant with love and concern like a mother inspecting her injured child. He then proceeded to blow on His upper cloth and gently cleaned Gajendran’s injured leg. Then Perumal bandaged Gajendran’s foot with His upper cloth. Perumal accepted the flower from Gajendran and granted Gajendran Moksham. The Lord is called as “Hari” when He incarnated to help Gajendran. “Hari” means thief in Sanskrit. The Lord is called as thief because when we think about Him, He steals away our sins. On a lighter note, may be the word “hurry” is derived because Lord Hari rushed to the aid of Gajendran! Anyone who thinks about the Lord saving Gajendran while waking up in the morning and shouts “Hari” seven times will be freed of all sins. This incarnation can be summarized in just three word as follows. “Varanam Karanam Naranan” i.e Varanam (elephant) Karanam (called) and Naranan (Narayanan came). It is shown in this narration that Perumal even comes to save animals as they too are jeevatmas like us. Perumal doesn’t discriminate amongst His devotees. 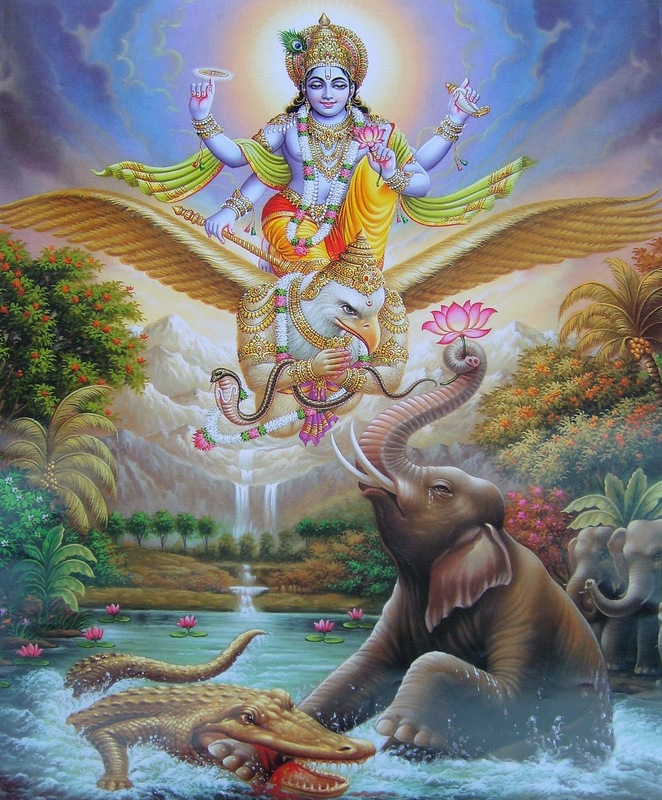 Whether His devotee is a man, woman, child, animal or a bird (Perumal as Lord Rama granted moksham to the eagle Jatayu), Perumal appears to save them. Fear of death and all fear at night time are dispelled when a person listens to the history of Gajendran with devotion. The legend Gajendra Moksham is said have taken place here in Sonepur. Meaning: Sree rama went to the forest which is terrible because of animals like elephants, deers and horses roaming about every where. He came out victorious in all the wars with rakshasas with bow and arrow alone as His weapon. He built a bridge across the roaring sea to cross to lankapuri which is protected by sea water and forts on all sides. He killed ravana and felt the purpose of His avatara is fulfilled by killing the enemies of His Baktas. He resides in Thiru Salagrama. 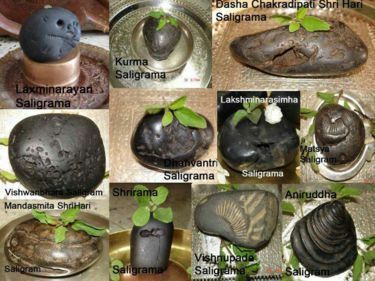 Salagramam means one kind of stone, that should not be treated as an ordinary stones like pebble or marbles etc. It is more precious and valued than any other stones, which are said to be Hamsam of Sri Vishnu and has lots of Power in it. To worship big idols, lots of regulations and rules are there, to be followed. But to worship Salagrama, no such strict restrictions are there and it is very simple to perform pooja. Now we shall see about the Salagrama Kshetram which is among the 108 Divya Desam known as Mukthinath and about the river Gandaki. In our journey, now we have reached Sonpur, where the confluence of river Gandaki and Ganga takes place. We have already seen about Ganga and now lets see about Gandaki. In our previous articles, we saw many prayag's of Ganga and we didn't discuss about Gandaki/Ganga confluence. Lets discuss about it in our upcoming articles. We are discussing on Salagrama and Mukthinath Kshetram to known the significance of river Gandaki.